How to cook Pickled Beets - Pickled beets is one of the easiest and, at the same time, the most delicious pickled vegetables of Turkish cuisine. It is considered one of the indispensable mezes of the Turkish raki tables. It is also good with hearty winter dishes such as legumes. Wear a dark color shirt or a very old one and put on an apron, beet stain is "the" toughest of all. Cut the tops and bottoms of beets and wash them really, really well. Place in a pot, cover with water, and cook until soft. (if a knife can go though them easily, then they're cooked.) This may take more or less 30-40 minutes. If you prefer a pressure cooker, set the timer for 15 minutes. Once they cool down, peel the beets (which is super easy once they're cooked) and preserve the cooking juice. Cut the beets the way you like; you can cube (as in the picture); slice; or halve them. Fill the jar with preserved beet juice. Close tight and refrigerate. It's ready to eat the next day; no need to wait for longer. 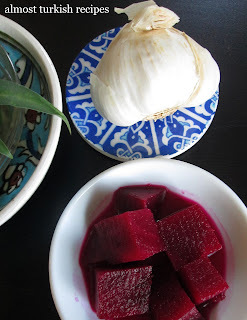 0 Response to "Pickled Beets (Pancar Turşusu) "